It’s been days and New Yorkers are still cleaning up from hurricane Sandy. All the city’s resources are being used for emergency and rescue services. This storm has caused so much destruction across the city, the damages are astounding. 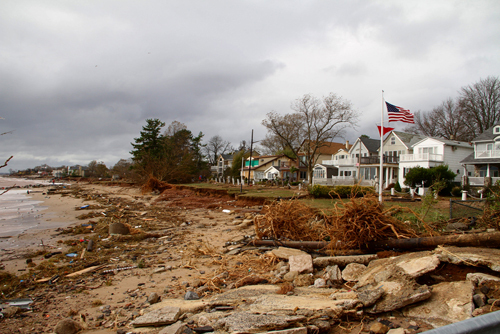 Sandy is described to be the most devastating storm in New York history. Fallen trees are incredibly dangerous. Anyone who sees one should report it immediately. Power outages and live wires should be directly reported to Con Ed (1-800-75-CON-ED) or LIPA (1-800-490-0075. Information on applying for federal disaster assistance can be found at: nyc.gov/severeweather. New Yorkers who want to volunteer to assist in the recovery should visit: facebook.com/nycservice. We are looking for doctors and nurses to volunteer in our shelters. Details are here. How to avoid carbon monoxide poisoning when using a portable generator. We are still seeing substantial power outages and Con Ed and LIPA are working hard to restore power as quickly as possible. We have already received over 7,000 fallen/damaged tree reports. People should stay away from power lines, parks, damaged trees, beaches, boardwalks and seawalls. People have lost their lives. Public schools will open on Monday, Nov 5th. NYU Langone Medical Center, Coney Island Hospital, New York Downtown, Manhattan VA Hospital have all been evacuated. We are monitoring the power needs at Bellevue Hospital and others. We are coordinating with 53 other healthcare facilities that are sheltering-in-place about water levels, staffing, and structural issues. East River bridges are open. We are working to clear our roadways. Anyone else who is on the road is impeding our ability to conduct an efficient cleanup. People should still stay off the roads as much as possible. Subways and buses are running on a limited schedule. Our 76 shelters will stay open today and we will continue to keep them open until those displaced by the storm can return home or find temporary housing. NYC drinking water is safe. The Department of Environmental Protection is responding to reports of sewer backups and flooding. Today, Nov 3rd, at 9am – volunteer clean-up on the East Shore. we will be meeting in New Dorp Beach at the end of New Dorp Lane and Cedar Grove Avenue (parking available in miller field) and break up into groups to cover hopefully Midland Beach and New Dorp Beach. The plan to do this again in South Beach and Oakwood Beach on Sunday, Nov 4th. PLEASE bring your own pushbrooms, rakes, shovels, work gloves, and garbage bags if you can, as our supplies are extremely limited! If you would like to be added to our volunteer email list, please email nysassembly60(at)gmail(dotted)com. FEMA, SBA for relief and federal loans, Human Resource Administration (food stamps, benefits and other stuff) and other City agencies are located right now at New Dorp Lane and Cedar Grove Ave down Miller Field in Staten Island for everyone who needs to fill out forms for assistance. Going on right now! Look for military colored tents! If you have items to donate do so! if you don’t but have some time to spare go to Midland Beach, New Dorp, Great Kills, Totenville and offer your time and help by cleaning up with the locals. Stand together, ask for help, help others and we will get through this!